Sam Scharff, Felipe Scharff, Jack Rotondo and Mitch Rotondo, from left to right, pose for a picture before Saturday’s BV Alumni Soccer Match. A pair of Buckeye Valley freshmen, Jack Rotondo and Felipe Scharff, have some pretty big shoes to fill this soccer season … their own. As the younger brothers of former Baron standouts, the two enter the 2017 campaign under uniquely similar circumstances. Jack’s brother Mitch and Felipe’s brother Sam were standouts for the Barons from 2012-15. Mitch and Sam were both four-year starters, both nabbed first-team all-conference honors four times and both are members of the 100 Club for points in a high school career. For Jack and Felipe, though, none of that matters … at least not to BV coach Eric Staley. “My expectation is that Felipe and Jack will bring their own shoes, as it were, instead of trying to fill someone else’s,” he said. “They are individuals; they bring their own characteristics. I told them both that I will never compare them to their brothers. Still, the two should see plenty of time this season. BV’s past and present players, including the Rotondo and Scharff brothers, were on the field at the same time at Saturday’s annual BV Alumni Soccer Match. Jack will wear the No. 8 this season … the same number his brother wore a few years ago. Buckeye Valley’s season opener is Aug. 18 at Heath. 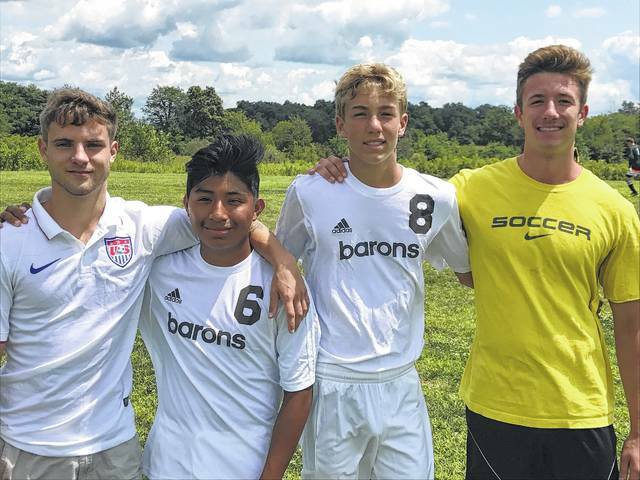 https://www.delgazette.com/wp-content/uploads/sites/40/2017/08/web1_two-brothers-soccer-pic-3.jpgSam Scharff, Felipe Scharff, Jack Rotondo and Mitch Rotondo, from left to right, pose for a picture before Saturday’s BV Alumni Soccer Match.